U.S. President Donald Trump on Friday revealed again his profound differences with German Chancellor Angela Merkel over defense burden, trade and the Iran nuke deal. In a joint press briefing with the visiting German leader, Trump complained again that the United Sates has shouldered a "far greater burden than we should have" in the defense of North Atlantic Treaty Organization (NATO). "Other countries should be paying more," he said. "We're protecting Europe and, yet, we pay, by far, more than anybody else." "NATO is wonderful but it helps Europe more than it helps us. And why are we paying the vast majority of the costs?" Trump asked. In response, Merkel said that Germany in 2019 will earmark 1.3 percent of its GDP for defense. "That has been an increase over the past few years. We haven't yet met the target where we should be, but we are getting closer to the target to the guideline that we've set up for ourselves," she added. Trump has lashed out at NATO members, Germany in particular, for failing to increase their national defense budget to the threshold of 2 percent of their GDP, something they promised in 2014 to achieve in 10 years. Trump also noted that the U.S. trade relations with Germany, and the European Union at large, were not "reciprocal." "We need a reciprocal relationship, which we don't have. The United States right now has a trade deficit with the European Union of 151 billion U.S. dollars ... it's been unfair," he said. The White House host further added that "there's no way we should have a trade deficit of 151 billion U.S. dollars. So we're going to make it reciprocal. We're going to make it a much more fair situation." "I believe that -- you know, when I look at the numbers in Germany -- and some other countries, they may not like Donald Trump but you have to understand, that means I'm doing a good job because I'm representing the United States," he said. 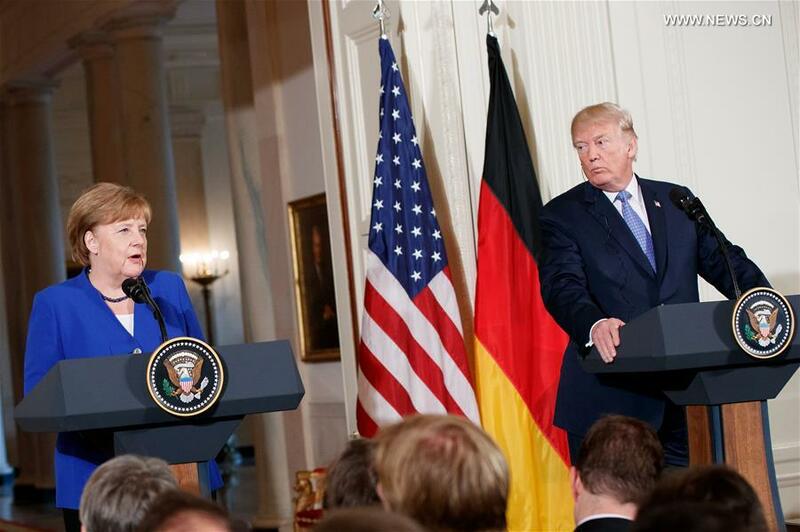 The two sides also seemed to have failed to reach convergence over Trump's earlier threat to increase tariffs on imported steel and aluminum, as Merkel said it is up to Trump to decide whether to exempt the European Union from the tariffs before the May 1 deadline. She only said that "we had an exchange of views on the current state of affairs of the negotiations, and the respective assessments on where we stand on this. And the decision lies with the president," referring to Trump. She also defended the German trade stance, saying that her government is already taking actions to change the imbalance. "The president obviously is not satisfied with the trade surplus. We have already been able to reduce that, our trade surplus that is with the United States, but we still have a long way to go. But the United States, also due to the tax reform, again has become a very interesting place to invest for our companies," she said. "We can say with great pride that not only hundreds of thousands of cars are exported from Germany to the United States, but from the U.S. to the rest of the world, hundreds of thousands of cars that are built here in the states are exported to the rest of the world with creating American jobs, and I believe that the workers here have very good working conditions," she added. As for the Iran nuclear deal, Trump vowed to ensure that Iran "does not even get close to a nuclear weapon, and that Iran ends its proliferation of dangerous missiles, and its support for terrorism." "We must also ensure that Iran does not profit from our success," he said, refusing to say whether to leave the deal, although his newly picked Secretary of State Mike Pompeo said earlier on the same day that Trump is unlikely to remain in the deal. Merkel acknowledged that the current deal is not sufficient, but said that Berlin believes that the deal "is a first step" that has contributed to the slowing of the Iranian nuke activities. Merkel paid a working visit to the United States on Friday, following French President Emmanuel Macron's high-profile state visit to the country.